Lovely Walt Disney character mug depicting Donald Duck. The character figure is three dimensional hand painted relief. Very good condition, no chips, cracks or repairs - some glaze crazing. Dimension : 3-1/2" H. Bottom marked : Walt Disney Productions, Japan, circa 1960. 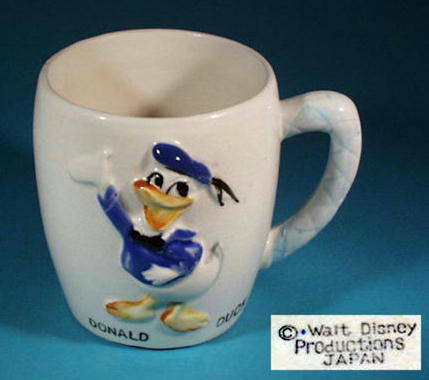 Items Similar To "DISNEY MUG - DONALD DUCK / PT008"